“Summer reading” is a pleasant tradition, along with holiday movies, Easter brunch, and many others I know you enjoy. I’d like to hear about some of them. The Los Angeles Times carried a list of books President Obama took on his vacation to Martha’s Vineyard. Included are a couple not considered exactly light reading – John Adams by David McCollough and Tom Friedman’s Hot, Flat, and Crowded. Bookstores often feature crowded tables full of books, many of them classics, considered good candidates for “summer reading”. Confess now, did you really read all the titles you brought with you? War and Peace doesn’t count! I am really enjoying Kitman’s The Making of the Prefident 1789: The Unauthorized Campaign Biography. It’s a very funny, very clever, very readable spoof on George Washington. As the Father of our country shall we agree he’s fair game. What makes a book readable for me? I can open it at any page and find continuity, the book maintains a lively pace, and generally the chapters are short. Kitman’s book is all of the above. In The Making of the President 1789, humorist and self-appointed historian Marvin Kitman satirizes the contemporary “campaign insider” book while making the case that George Washington was not only “First in War, First in Peace” – he was also first among the Founding Fathers in gambling, drinking, and social climbing. And that’s not to mention his weakness for the Founding Girlfriends. Washington looked good, married well, that usually means rich. He engaged in wealth-inducing activities such as land speculation. His constant debt was respectable because after all, it was tied to being a large landowner and planter. Above all, he developed the right social graces, cultivating influential people around him. Even wearing his splendid uniforms was a powerful campaign tactic. His constant professed modesty got him elected unanimously as our first president. Washington had the luck to be in the right place at the right time. Will I have the chance to read more in these waning days of summer? I have selected Cooperstown Confidential: Heroes, Rogues, and the Inside Story of the Baseball Hall of Fame. I could finish it by the time of the World Series. Our Founding Fathers excelled in their accomplishments and importance. Others also contributed a great deal to the outcome of our revolution – men such as Sam Adams, John Hancock, Patrick Henry. Also among them is John Paul Jones, dubbed “the Father of the American Navy”. He was born John Paul in Scotland in very modest circumstances. At 13, he was already apprenticed in the British navy. He showed very quickly that he was a brilliant sailor, full of daring and cunning. John Paul Jones wreaked havoc on British shipping during the Revolutionary War. He didn’t wait for enemy shipping to come to him – he went where it was located in Great Britain and inflicted his damage there. Astute superiors saw his skills and advanced him to larger and larger vessels. John Paul’s life was often a contradiction. He had intense ambition, craving to impress those with higher rank and above all, background. Benjamin Franklin was his long-time friend. There were times when John Paul Jones was a celebrity with honors from foreign countries, the toast of many in Europe. Two incidents determined why he came to the colonies in the first place. They occurred in Tobago in the West Indies. An unfortunate murder charge for the death of someone under his command put a price on his head. Jones always claimed it was self-defense. One of his crews threatened mutiny. John Paul literally fled, leaving everything. Jones was added to his name when he arrived in the colonies, to give him a better chance of escaping the law in Tobago. Once here, he began to make the rounds of the shipping business. He disclaimed any allegiance to Great Britain and became an ardent patriot. Not too many questions were asked of those who pledged all their effort to our Revolutionary War. Any of you that have knowledge of ship structure and capability at the end of the 18th century have a real advantage understanding John’s victories, many against much more powerful ships. Vessels were very complicated, requiring detailed knowledge to keep them running in top shape. Jones had all that. Often he would perform needed repairs himself when necessary. On the ships under his command, he was everywhere, always came up with a plan, got top performance from his crews, and never just barked orders from a cabin. He wanted to make admiral. The greater his success, the more jealousy he created. Some superiors were his dangerous rivals. Jones’ most celebrated naval battle was with the powerful British HMS Serapis, when his own Bon Homme Richard (named for Franklin’s Poor Richard’s Almanac) sank. It was at this engagement when Jones is reputed to have exclaimed his most famous quote, “I have just begun to fight”. Those words probably explain his naval philosophy and style better than any other. He wanted fame, and got it. But it didn’t last. Foreign engagements, such as for Catherine of Russia, were not successful. Other American sailors got the plush assignments. Jones faded from view and seemed forgotten. We know he was very ambitious. Well, so was George Washington. I think ambition is probably an intrinsic requisite for anyone striving to attain the top. But Jones and Washington used ambition very differently. Washington was intent on always being where the power brokers were, the social giants, the political leaders. His conduct was a success. He was sought after, admired, made President. Jones’ life took a very different direction. He was most of the time on the high seas, away from the influential people who could advance him. Later in his life, it made him bitter that he was not appreciated as he felt he deserved. He died at 45 in France, and buried there without any real recognition and fanfare. It took until the beginning of the 20th century for us to give him the honors he so justly deserved. The Naval Academy at Annapolis established a grave site for him, appropriate for a hero of his magnitude. With a new Supreme Court justice in place, as usual there’s been a lot of discussion about our Constitution. It is often portrayed as something mysterious whose every word needs explanation. I don’t see it that way at all. The words seem simple, to the point. Of course, today when every social ill looks to the Constitution for remedy, those words have to be stretched very far. What is the role of our Supreme Court regarding it? Do all our constitutional experts shed new light on the Constitution’s meaning? What does our Constitution really have to decide? Even with lifetime appointments no one can predict how a justice will vote, or which cases will be hard, or if a new amendment is being loudly promoted. Many cases submitted for constitutional review are never heard at all. A lot are sent down to lower courts, for further review. Just four years after the end of our revolutionary war (1783), why did we need a federal government, with its operating manual, a constitution? After all, the states already had their Articles of Confederation, which I will describe as a friendship pact between them. However, some rather amazing developments had occurred. Some states had their own currencies; sometimes duties and fees were extracted from other states when their goods reached borders; obviously the situation could not continue. Worst of all, there was no way to raise revenue for general purposes, such as maintaining an army. I know that any country without a system of reliable taxation won’t last very long. But when the concept of a Federal Republic was proposed, there was intense suspicion, some of the strongest coming from ardent patriots of the Revolution itself, for instance Patrick Henry. Any federal republic or government would only swallow up the power of the states, and grab all of it for itself. A federal government would soon become corrupt and dictatorial. Of course, the federal versus states conflict persists to this day. It occupies a lot of constitutional experts. You can just imagine what controversy it raised in 1787. After all, a huge war was just fought to liberate the colonies from the power of Great Britain. In spite of the enormous dissent, a constitutional convention was organized in, where else, Philadelphia. Delegates were very different from the familiar leaders of our revolution. Some of the delegates were professional politicians. Many were not that well-known, or promoted. Many delegates did not even have clear directions from their colonial legislatures. The convention saw the rise of two very prominent post-revolutionaries, Hamilton and Madison. They were the outstanding architects of the Constitution. There was no call for unanimity. If anything significant came out of this convention, it didn’t need to be ratified by every colony. The proceedings were to be held in secret. Fear about the interference of the public rabble was one compelling reason. In spite of strong reasons to justify the need for secrecy, I just can’t really accept it. The feeling that any government “hides” facts is very strong for the average citizen. The concept of a Federal government got great advertising. From 1787 to 1788, The Federalist Papers by Hamilton and Madison, and to a lesser degree Jay, laid out why a Federal government would benefit the new country enormously. The fact that the constitutional deliberations had so many problems makes the final results so outstanding. Miracle At Philadelphia , a prominent book on the proceedings, is an accurate description. Many amendments have refined and expanded the Constitution over the years. There is nothing static about this document. This is its strength and potential weakness. A call for a new amendment crops up quite frequently. Many of these call for Congressional legislation, not the Constitution! 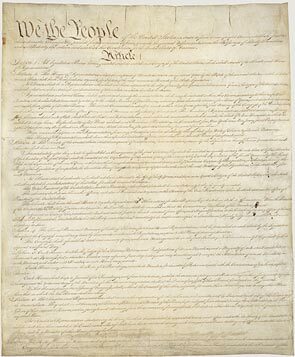 The final constitution was accepted by the convention on September 17, 1787. I don’t understand why this date is virtually ignored, not even noted. Miracle At Philadelphia: The Story of the Constitutional Convention May - September 1787 . Catherine Drinker Bowen, an Atlantic Monthly Press Book, 1966.